In this post, I will just mention some of the issues with date format from my own experience, in hope that this will help somebody to save few hours of tracing Magento to find the solution :-). Let’s say that we want to choose 30th March as Date of Birth. 03/30/76 as it supposed to be. But when we try to save the customer, it generates an error message. “Date Of Birth” does not fit the entered date format. After some debugging and researching, I found that Magento reverses the date and it tries to save it like 3rd day of 30th month which is of course the thing that causes the error on date validation. I also found that we forgot to set input/output filter of Customer Date Attribute to “Normalize Date” value and it caused the problem. Navigate to Customers -> Attributes -> Manage Customer Attributes. Search for attribute with code “dob” and click on displayed row to edit attribute properties. Set Input/Output filter to “Normalize Date” value and save the attribute. Now let’s try to edit our customer Date Of Birth again and it works! When working on German site, we discovered some strange behavior of DOB customer attribute. 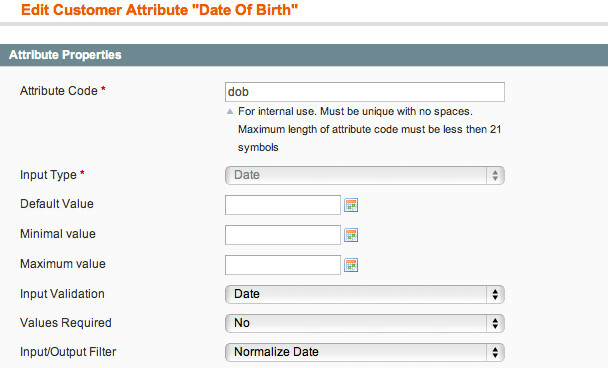 In Magento adminhtml on Customer edit screen we have a field named “Date of Birth”. the question is what year is saved inside database? Is it 1956 or 2056 ? Unfortunately, I found that saved year is 2056. One of possible solutions was to override Magento’s functionality and implement different date format for calendar widget in adminhtml, to get full year number in date input. After refreshing customer edit screen in Magento admin, we can see that DOB date format has changed. Also, please be aware that now we also changed the other fields that uses this method to render date picker …. We are developing a website for one of our clients who has a product list of more than 15000 products. The site is dealing in car parts and we have to give the “From” and “To” Model Year of the products. e.g. a specific product is suitable for a car model year from 1996 to 2000. Now when we do the search in Magento, it doesn’t recognize the year if we put it as 1997 or 1998 or 1999, It just shows the products if we enter the year 1996 or 2000 in the search criteria. For example the site owner is having a product suitable for a BMW 3 series made from the year 2010 to 2013. Now if in the search box, we add 2011 as the year, it doesn’t show the products. It only shows the related products if we select the year 2010 or 2013 and not for any year in between. Could you please suggest a solution for this. Date picker fill dates in the format DD/MM/YY but validator.js (line 503) fail to create the new date(v) obj. Interesting read. I have a problem similar to your Issue 1. I have a module for adding Customer Attributes. My locale is UK so everything works in d/m/Y format. The calendar picker picks a date that show d/m/Y. But when you process the form (either registration or checkout) the day and month are transposed. This doesn’t happen on the admin side. I’ve been trying to track down the problem for ages. What module / setup are you using in this example? Is it CE with a module, or EE? I don’t have the “Input/Output Filter” option available in the module I’m using for customer attributes. Do you know what field that updates and what value does “Normalize Date” give the field? Would you be able to contribute that with fix to https://github.com/magento/magento2 Magento 2 repository? this would be awesome and help us expedite such issues.